Our first trailer for 2015, and it is using marketing in an incredibly clever way. I know many people are already doubting "Ant-Man," and so many are already calling it the first disappointment Marvel will produce since they went independent in 2008. And man, is it easy to think that way. What can you think after a film looses not only three actors, but its director. Edgar Wright wasn't some lucky hire Marvel nabbed for their small superhero, this was a guy who was planning this movie since 2008, and Marvel President Kevin Fiege pulled a lot of strings so that Wright could make this movie when he felt ready to make it. Sadly, a disagreement with someone at Marvel led to Wright leaving the project. It is very sad, and imagining what Wright's take on this material would look like is going to be one of the biggest Movie Geek questions that will stay unanswered. But who knows what Peyton Reed will do with the material, especially after a Adam McKay re-write. I have hope. Marvel hasn't let us down yet, and it seemed so easy to banter "Guardians of the Galaxy" last year. But that movie not only shattered expectations, it shattered the box office. 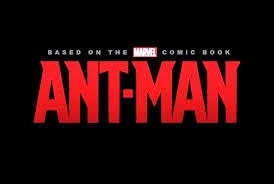 I am overjoyed, not hesitant about Marvel finally taking the audience down some weirder corners of its universe, and if they just keep the energy they have had since 2008, then "Ant-Man" is going to be another winner this year. I think its already off to a good start with its add campaign, creating an "ant size" trailer for the trailer. I still don't quite understand why our culture is so fixated on the trailer for a trailer deal going on right now, but this is a perfect way to tease a movie using its style. The actual trailer will premiere this week on the first night of "Agent Carter," something I will be reviewing for this site weekly. So stay updated, we'll have a lot to talk about here this Tuesday.